http://newiprogressive.com/images/stories/S5/tom-sieber-people1-280h.png Brown County Supervisor and newcomer to State politics is getting out to talk to people. Says politicians in Madison are no longer concerned about their interests. GREEN BAY, WI - Democratic challenger Tom Sieber raised over $14,000 in the month of July which is normally a slow month for fundraising. 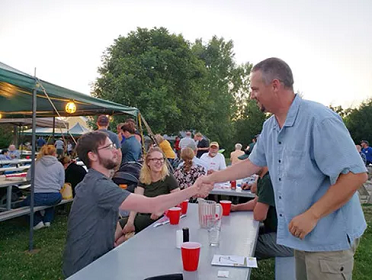 Despite starting to raise money in mid-April of this year, Year To Date fundraising totals for Sieber are now over $50,000 which is almost $2,000 more than the incumbent has raised the entire year. For the reporting period covering July 1st- July 30th, Sieber out raised the incumbent $14,448 to $3,210.